A special focus of my research is the biology of subjective experience – particularly of affective “background” phenomena. In 2013, we postulated a dimension of “phenomenal depth”: a structural feature of experience that indicates one’s “embeddedness”. On the one hand, it is thought to capture feelings of unrealness and detachment from self and world as they are part of the normal experiential spectrum but are chronically altered in psychopathology, most notably in depersonalization-derealization disorder (DPD). During my PhD, I investigated self-related and emotional processes in patients with DPD using f/MRI. We found volumetric changes and altered white-matter connectivity in patients with DPD. We also extended the spectrum towards feelings of realness in artificial or virtual environments – where they are associated with the concepts of presence and immersion. In healthy participants, we found that movies in 3D were more strongly experienced than in 2D – especially for people with higher tendency of immersion (top row). 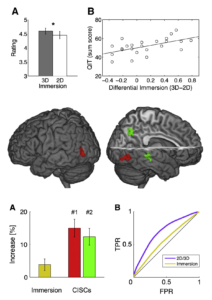 Using fMRI and canonical correlation analysis, we found that movies in 3D also increased the similarity of brain activation between viewers compared to the same movies in 2D (the peaks of the two strongest brain networks in the middle row) and from the degree of similarity, we could decode if a movie was shown in 3D or 2D and if a movie was experienced more or less strongly (bottom row). As immersive VR is impossible in the MRI environment because subjects cannot move their heads, we’re currently combining mobile brain imaging techniques like EEG or fNIRS (and peripheral physiological measures) with VR head-mounted displays for example to investigate emotional arousal.